Kurt Etchingham sent the following request for information. We’re seeking any information, facts, hints, suggestions, about his family and antecedents from Grewelthorpe. We’d also be happy to share what we know of his descendents, should anyone have an interest. I have found the following entries in my records for Taylors living in Grewelthorpe. Elizabeth Taylor. Bap. 6.1.1762. Dau of Matthew of Grewelthorpe. [These baptisms would be at Kirkby Malzeard as Grewelthorpe did not have a church then]. Matthew Taylor. Bap. 20.8.1763 son of Matthew. Sarah Taylor. Bap. 20.1.1766 dau of Matthew. William Taylor. Bap. 8.3.1789 son of Matthew. [I would guess this is the Matthew born 1763] This also could be your William. Catherine Taylor. buried 13.2.1816 age 87 [born 1729] Matthew & Catherine could be man and wife or brother and sister. After this I can not find any records for Taylors altho I do have a gap in my records from 1792 to 1850. I hope this is helpful and I will keep on looking. 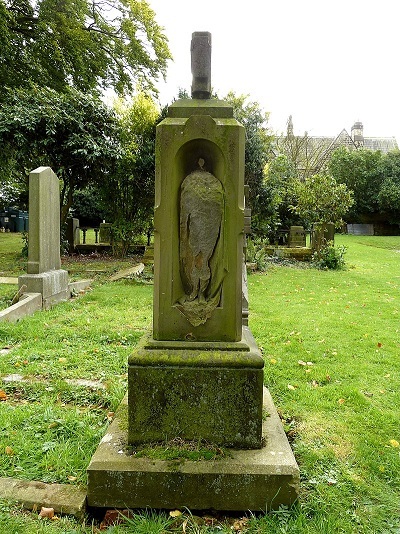 I have found your photos of the grave on ancestry.co.uk. From Kurt 14.6.2011. Hi, Barbara. Thank you so much for your amazingly rapid response. These are certainly tantalizing leads to pursue. William and his wife Hannah had 5 children. They were named Elizabeth, Sarah, William, Matthew, and Catherine! Not uncommon names, by any means, but to have these same 5 given names turn up in the records you found is intriguing, to say the least. It would seem likely that “my” William is somehow connected to the lineage you found. The tricky bit will be figuring how and then confirming it. A brief side note on William and Hannah’s gravestone: Their son Matthew was a professional sculptor. It is probable that Matthew carved his parents’ monument, although I have yet to absolutely confirm that. In 1880, Matthew was invited to exhibit at the Spring Exhibition of the Yorkshire Fine Arts Society. One of the pieces he chose to display was a bust entitled “Portrait of the Artist’s Father.” Oh, to find a copy or a photo of that! Yet another quest! It’s what I love about genealogy. Kurt wrote again July 2017. I found another very tiny clue to the history of the Taylor family in Grewelthorpe in the digitized and transcribed burial records from Leeds General Cemetery that are online at the Leeds University Library Special Collections website. The record for William Taylor (who was born at Grewelthorpe) lists his parents as Matthew and Elizabeth Taylor and Matthew’s occupation as farmer. The informant who supplied the information was William’s son, also called Matthew. Male. Joiner. Died 24.5.1873 age 80yrs. Bronchitis. The grave of Matthew Taylor. Thanks to Linda OCarroll for this photo. 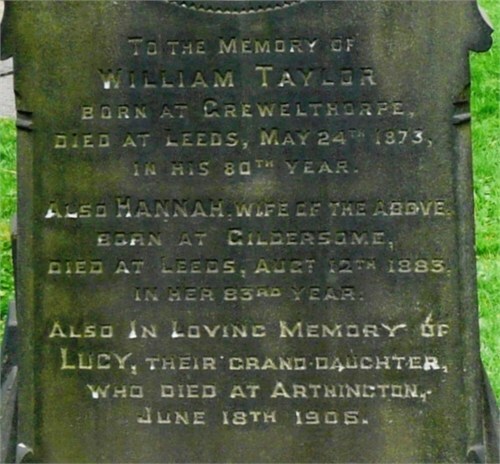 Inscription on the grave of William Taylor to be found in Leeds. Another Taylor from Grewelthorpe. Found in the Leeds Mercury newspaper dated 1938. In her 79th year REBECCA BOYLE, dearly loved wife Arthur TAYLOR, of Restholme, Grewelthorpe.— Funeral to-morrow (Saturday), October 15. at St. James Church. Grewelthorpe. at 2.30 p.m. Friends please accept this (the only) intimation. Arthur Taylor Rebecca’s husband died April 1950 aged 92. [born C1858] He is buried in Grewelthorpe graveyard alongside his wife. Other Taylors from the area. ARCHIE TAYLOR. Born 14 Nov 1857. A retired farmer, widower, living Restholm Grewelthorpe in 1939. ARTHUR TAYLOR. Born 2 Dec. 1875. A public works platelayer. Living Kirkby Malzeard in 1939 widower. ARTHUR TAYLOR. Born 2 Nov 1899. Married to Mary A [born 1903] Farmer. Living Manor House Winksley in 1939. BESSIE TAYLOR. Born 10 Oct 1934. Dau of Arthur & Mary A. of Winksley. Later married ? Baul. CYRIL TAYLOR. Born 27 March 1902. A bricklayer. Living Ure Bank Top Ripon in 1939. ROBERT HENRY TAYLOR. Died in Grewelthorpe on 9.9.1953. It is possible his wife was Anna Marie. FRANK TAYLOR . Born Aug. 24 1896. Died 25.12.1955 Grewelthorpe. Married to Gertrude May Born 1893]. Brother of Nora Brockbank. Frank was the sub postmaster in Grewelthorpe. An ARP Warden in WW2. GERTRUDE MAY TAYLOR. Born 11 July 1893. Died 27.5.1977 Grewelthorpe. Wife of Frank. IRENE TAYLOR Born Nov. 7th 1927. Dau of Frank & Gertrude. Married ? Newark. THOMAS E. TAYLOR. Born 27 April 1888. Married to Lois [born 1882] A motor driver living Mickley in 1939. If anyone can add to this information please contact the site.